For the video game, see Krater (video game). For other uses, see Crater (disambiguation). 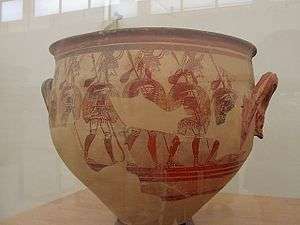 Krater discovered on the acropolis of Mycenae, depicting fully armed warriors, date 1200-1100 BC. Located in the National Archaeological Museum of Athens. Multiple cultures, originating predominantly in Greece and exported. Wikimedia Commons has media related to Kraters. A krater or crater (Greek: κρατήρ, kratēr, lit. "mixing vessel") was a large vase in Ancient Greece, particularly used for watering down wine. At a Greek symposium, kraters were placed in the center of the room. They were quite large, so they were not easily portable when filled. Thus, the wine-water mixture would be withdrawn from the krater with other vessels. In fact, Homer's Odyssey describes a steward drawing wine from a krater at a banquet and then running to and fro pouring the wine into guests' drinking cups. The modern Greek word now used for undiluted wine, krasi (κρασί), originates from the krasis (κράσις, i.e. mixing) of wine and water in kraters. Kraters were glazed on the interior to make the surface of the clay more impervious for holding water, and possibly for aesthetic reasons, since the interior could easily be seen. At the beginning of each symposium a symposiarch (συμποσίαρχος), or "lord of the common drink", was elected by the participants. He would then assume control of the wine servants, and thus of the degree of wine dilution and how it changed during the party, and the rate of cup refills. The krater and how it was filled and emptied was thus the centerpiece of the symposiarch's authority. An astute symposiarch should be able to diagnose the degree of inebriation of his fellow symposiasts and make sure that the symposium progressed smoothly and without drunken excess. Drinking ákratos (undiluted) wine was considered a severe faux pas in ancient Greece, enough to characterize the drinker as a drunkard and someone who lacked restraint and principle. Ancient writers prescribed that a mixing ratio of 1:3 (wine to water) was optimal for long conversation, a ratio of 1:2 when fun was to be had, and 1:1 was really only suited for orgiastic revelry, to be indulged in very rarely, if at all. Since such mixtures would produce an unpalatable and watery drink if applied to most wines made in the modern style, this practice of the ancients has led to speculation that ancient wines might have been vinified to a high alcoholic degree and sugar content, e.g. by using dehydrated grapes, and could withstand dilution with water better. Such wines would have also withstood time and the vagaries of transportation much better. Nevertheless, the ancient writers offer scant details of ancient vinification methods, and therefore this theory, though plausible, remains unsupported by evidence. This form originated in Corinth in the seventh century BCE but was taken over by the Athenians where it is typically black-figure. They ranged in size from 35 centimetres (14 in) to 56 centimetres (22 in) in height and were usually thrown in three pieces: the body/ shoulder area was one, the base another, and the neck/ lip/ rim a third. The handles were pulled separately. These are among the largest of the kraters, supposedly developed by the potter Exekias in black figure though in fact almost always seen in red. The lower body is shaped like the calyx of a flower, and the foot is stepped. The psykter-shaped vase fits inside it so well stylistically that it has been suggested that the two might have often been made as a set. It is always made with two robust upturned handles positioned on opposite sides of the lower body or "cul". 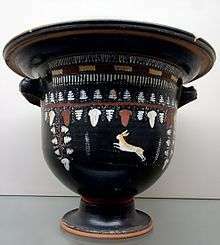 This type of krater, defined by volute-shaped handles, was invented in Laconia in the early 6th century BC, then adopted by Attic potters. Its production was carried on by Greeks in Apulia until the end of the 4th century BC. Its shape and method of manufacture are similar to those of the column krater, but the handles are unique: to make each, the potter would have first made two side spirals ("volutes") as decorative disks, then attached a long thin slab of clay around them both forming a drum with flanged edges. This strip would then have been continued downward until the bottom of the handle where the potter would have cut a U-shaped arch in the clay before attaching the handle to the body of the vase. This form looks like an inverted bell. All bell kraters are red-figure. 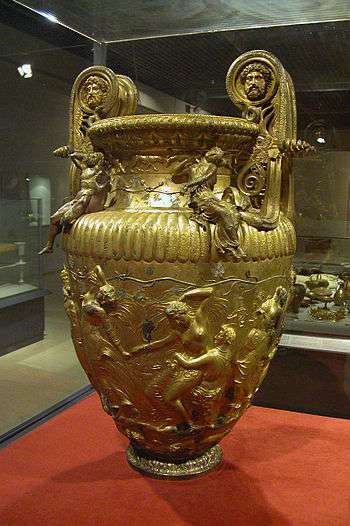 According to most scholars ceramic kraters imitated shapes designed initially for metal vessels; these were common in antiquity, but survivals are very rare, as the metal was recyclable. Among the largest and most famous metal kraters in antiquity were one in the possession of the Samian tyrant Polycrates, and another one dedicated by Croesus to the Delphic oracle. 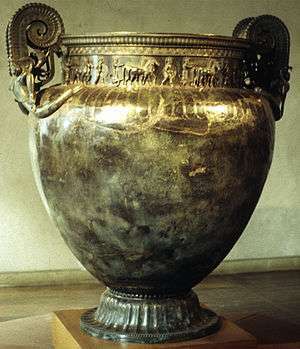 There are a few extant Archaic bronze kraters (or often only their handles), almost exclusively of the volute-type. Their main production centres were Sparta, Argos and Corinth, in Peloponnesus. During the Classical period the Volute-type continued to be very popular along with the calyx-type, and beside the Corinthian workshop an Attic one was probably active. Exquisite exemplars of both volute- and calyx-kraters come from Macedonian 4th century BC graves. Among them the gilded Derveni Krater represents an exceptional chef d’œuvre of late Classical metalwork. The Vix bronze crater, found in a Celtic tomb in central France is the largest known Greek krater, being 1.63 m in height and over 200 kg in weight. Others were in silver, which were too valuable and tempting to thieves to be buried in graves, and have not survived. Ornamental stone kraters are known from Hellenistic times, the most famous being the Borghese Vase of Pentelic Marble and the Medici Vase, also of marble. After rediscovery of these pieces, imitations became a staple of garden decoration in the Baroque and Neoclassical periods. The French artist and landscape designer Hubert Robert included the Borghese Vase, both alone and together with other stone kraters, in several of his works. ↑ Toby Schreiber (1999). Athenian Vase Construction: A Potter's Analysis. Getty. p. 138. ISBN 978-0-89236-465-7. Retrieved 23 September 2013. ↑ Andrew J. Clark; Maya Elston; Mary Louise Hart (2002). Understanding Greek Vases: A Guide to Terms, Styles, and Techniques. Getty. p. 105. ISBN 978-0-89236-599-9. Retrieved 23 September 2013. ↑ Toby Schreiber (1999). Athenian Vase Construction: A Potter's Analysis. Getty. p. 137. ISBN 978-0-89236-465-7. Retrieved 23 September 2013. ↑ Grasselli, Margaret Morgan, Yuriko Jackall, et al., Hubert Robert, The National Gallery of Art, Washington, 2016.